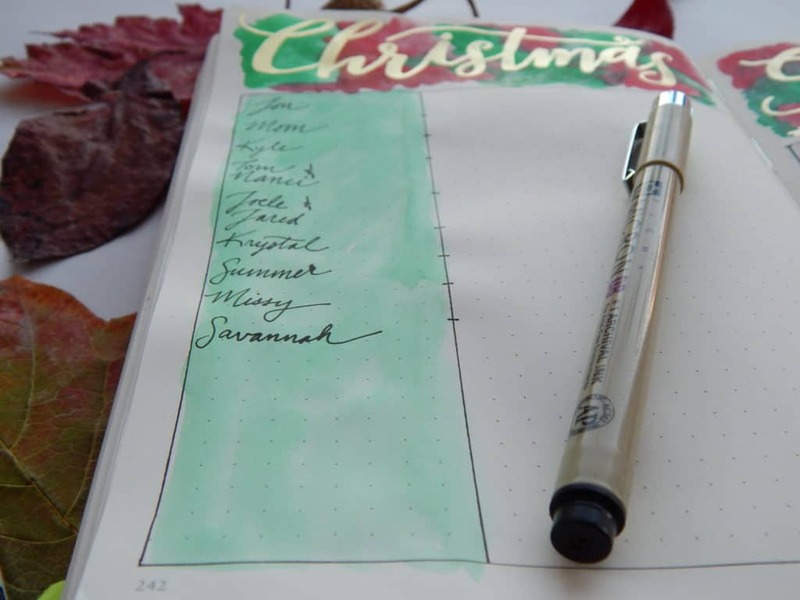 You are here: Home / Bullet Journal / Organized Christmas List – Keep All Your Gift Ideas in One Easy Place! 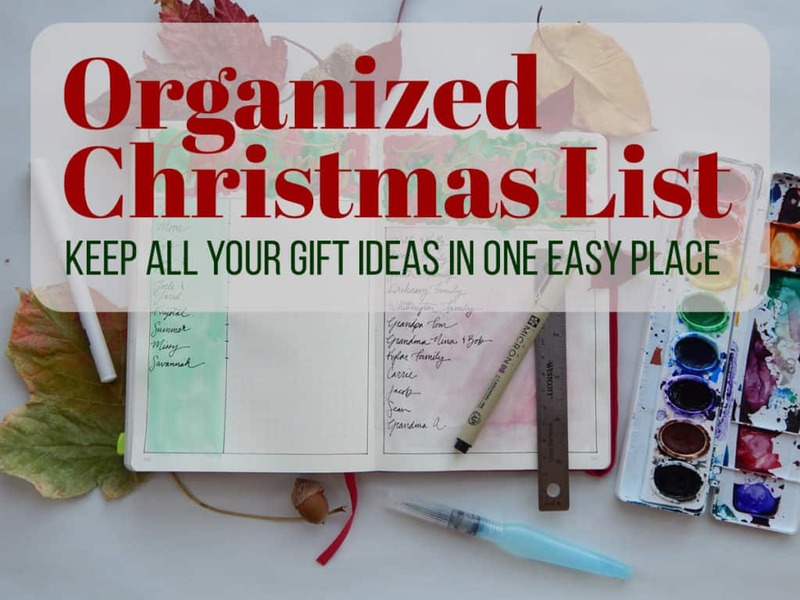 Organized Christmas List – Keep All Your Gift Ideas in One Easy Place! When you have a family as big as mine, Christmas can be nuts. I am the child of divorced parents AND I’m married – meaning I can easily have three to four Christmas celebrations each holiday season. To make it worse, I am terrible at gift-giving. I feel lost every December because I have no idea what people want or need, or how I’m going to fit it all in my budget. Surely people have mentioned things they want throughout the year, but I can never remember those gift ideas when we’re in the season of giving. It’s kinda like how when someone asks you to sing off the cuff and you suddenly can’t remember a single song to save your life. In an attempt to combat this, I decided to try a new organized Christmas list to take some stress off of next year. Before I get into the nitty gritty of my organized Christmas list, I wanted to do a public service announcement for 20-somethings or anyone struggling financially. Don’t feel like you need to get everyone a gift. If you are a student or a young professional who is struggling with money, don’t hurt yourself financially for the sake of Christmas. For years while I was in college, I felt an enormous pressure to get everyone a present. A few years ago, I tried getting all the family units in my gigantic family a “movie night” present. I gifted a $5 of Redbox coupons, single bag of popcorn, and single box of candy (you can totally steal this idea, BTW). Despite this extremely small gift, it still managed to cost me nearly $200. After that, I decided that it simply wasn’t worth it. I’m struggling financially and I can’t afford to give everyone a gift they may not want or need. If I have any family members that don’t understand that, then they can shove it. I have decided to treat Christmas as an opportunity to show the near and dear people in my life how much I care. That means immediate family and friends only. My point is that if you are still getting your legs underneath you, Christmas doesn’t have to cripple you financially for a few months. I am calling on young adults especially because I honestly thought that giving everyone a gift was a part of adulthood. In reality, managing my finances and saying no to ridiculous expenses – THAT is adulting. Learn to swallow the weird guilt associated with Christmas and move on. If you’re worried about it, learn brush lettering and make nice cards for everyone. Also, go ahead and learn how to balance your budget. I did and it’s not as hard as you’d think. Okay, the public service announcement is over! The bullet journal is incredible for lots of reasons, but one trait of this system that truly rocks is its central location. You see, I’m a list-making squirrel. I gather far more than I need and leave these lists scattered about in various locations to only lose half of them. This would always happen for me with Christmas gift lists. I would jot down a great idea in March for a potential gift and misplace it well before autumn. 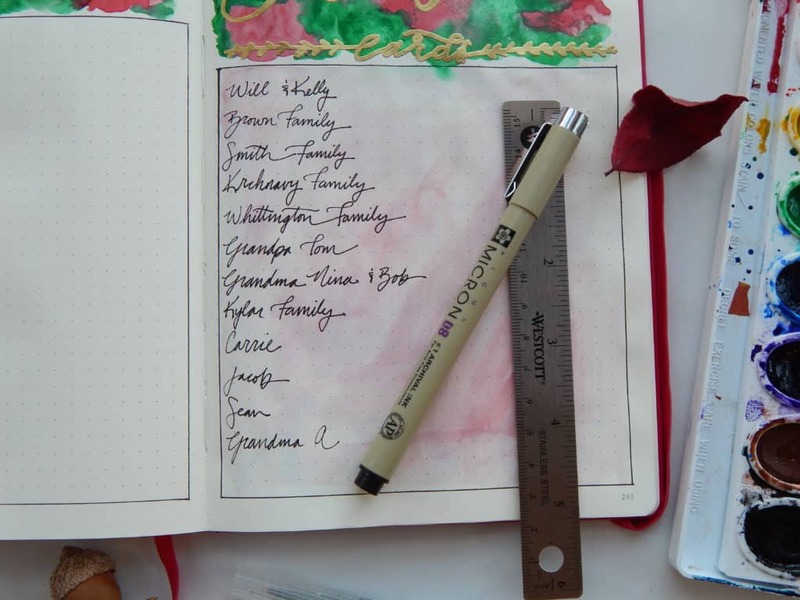 Keeping an organized Christmas list in my bullet journal means that I can’t really lose it (unless I lose the whole Leuchtturm– then I have bigger issues). I don’t even need to worry about moving this spread into each bullet journal as I go. If I reference it in the index, I can find it easily on my bookshelf. And if inspiration strikes when I’m away from my old bullet journal, I can take a quick note in my daily entry and copy it later when I have time. Using this listing system, I don’t need to worry about forgetting a great gift idea. I can hoard them all in one place and make my Christmas shopping go way smoother. The basic set up can be as complex or as simple as you like. I only dedicated two pages to my organized Christmas list, but that could easily be expanded to fit more people or more space per person. On the left page, I have a column for all the people who will (hopefully) receive gifts. Then I leave each name a few lines to add fantastic gift ideas. Naturally, I left this all blank so I wouldn’t give myself away to any loved ones who are reading this right now. I used my trusty Micron pens to draw out the boxes and columns, paired with my baby Wescott ruler. On the next page, I have a big old box where I can write the names of individuals or family units who will be receiving a holiday card. I left plenty of room so I can expand on this if I need to. And that is seriously it. The fundamentals of this organized Christmas list are extremely easy. But I bet you’re wondering how I made it look so Christmasy, right? I’m not someone who sings Christmas carols in October. I am one of those people who refuses to even acknowledge Christmas until Thanksgiving is finished and gone. But when I’m in, I’m in. I just cannot help myself when it comes to getting decorative. I will happily take twice as long on a spread to make it really reflect that holiday cheer. This is exactly what happened here, so please forgive how hilariously in-your-face it is. I needed to make an enormous golden header. I simply had to, my friend. It’s Christmas! If this isn’t the time to go all out, then I don’t know what’s what. I used my Pentel Aquash Water Brushes to paint on my vibrant red and green splashes. The paint is from the Prang palette, which works wonderfully. 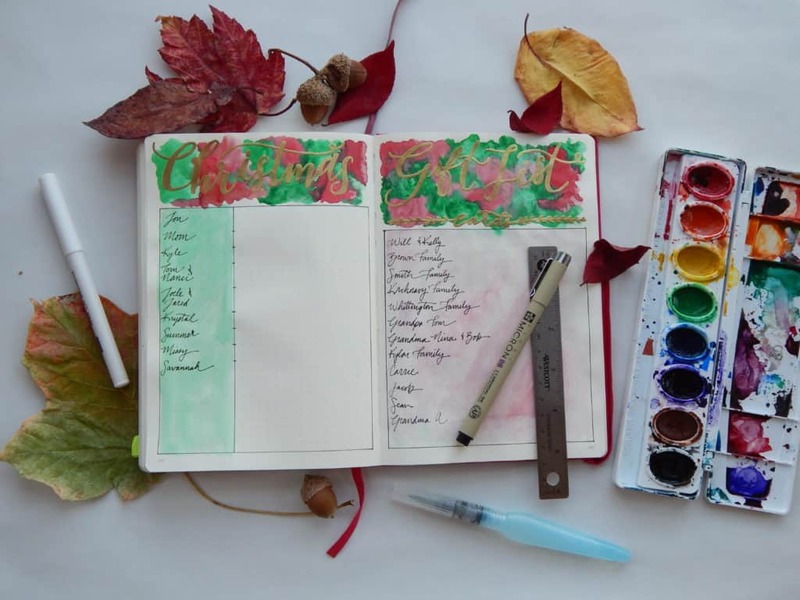 If you’re looking on and feeling scandalized by my use of paint in a journal – but curious – I have whole post about using watercolors in a journal here. For the gold headers, I had two options: I could use my gold Finetec palette or emboss it. I decided that the paper might not take kindly to more watercoloring, so I went with embossing. Of course, if you want to try embossing in your journal, check out my step by step so you know exactly what you need to do! And if you are wondering whether I used an embossing brush pen, I did not. I just applied the basic principle behind brush lettering and used a regular bullet tip pen. It works wonders! This organized Christmas list isn’t a particularly novel idea, nor a complex one. But it is easy to forget the stress of the holidays after a few weeks of January, leaving the future Christmas season vulnerable to the same issues. So consider this a reminder to start now and get on top of it for next year! It might be too late to fully remove stress from gift shopping this year, but you can still save yourself before history repeats itself. If you need some quick inspiration to knock out this year’s Christmas shopping, check out my various gift ideas posts! 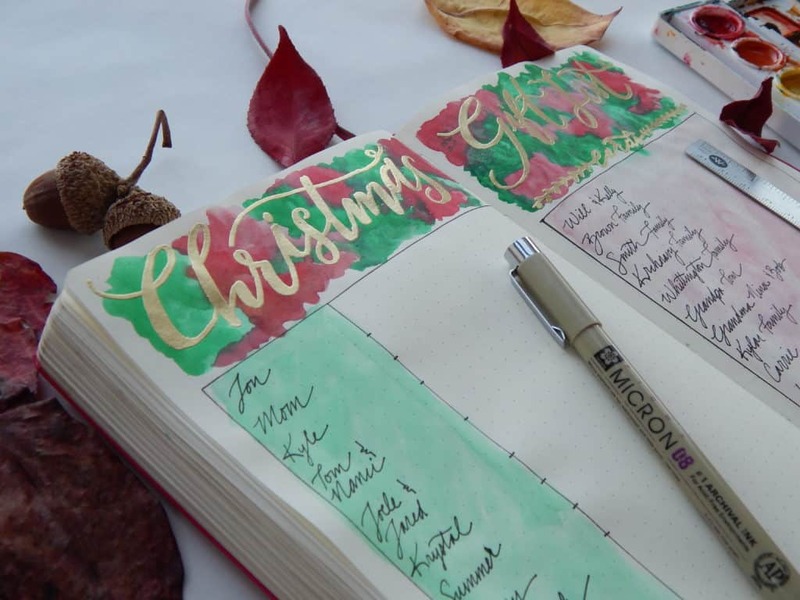 Create an organized Christmas list and get ahead of your gifts! You’ll thank yourself in a year, I promise. Whew! I made the cut! ???? 😉 of course you did, Mom!